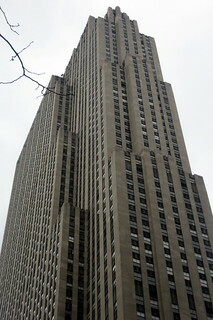 The GE Building at 30 Rockefeller Plaza, an 860-foot, 70-story Art Deco skyscraper, was completed in 1933 as the centerpiece of Rockefeller Center. Originally named the RCA Building for its main tenant, the Radio Corporation of America, formed in 1919 by General Electric, it is famous as the headquarters and New York studios of the National Broadcasting Company (NBC), also owned by GE. After RCA was reacquired (and split up) by GE in 1986, the building was renamed two years later. The building looks dramatically different when viewing its narrow and wide facades. From 5th Avenue it is an elegant, narrow shaft while looking down 6th Avenue it forms an enormous slab. The vertical and Gothic-inspired detailing of the austere Art Deco facade is integrated with a slim, functionally expressive form. Granite covers the building base to a height of 4 ft, and the shaft has a refined facade of Indiana limestone with aluminum spandrel panels. Unlike most other tall Art-Deco buildings constructed in the 1930s, the GE Building has no spire on its roof. The present exterior is recognized for the big GE letters at the building's top. The open lobby was the first of its time and rich materials, reduced black and beige ornamental scheme is enhanced by dramatic lighting. Below the building is a shopping concourse that was accessible from the lobby by the first elevators grouped in the central core of a building. The top floor of the building is an event room and restaurant named the Rainbow Room. The observation deck atop the skyscraper, "Top of the Rock," had been closed since 1986 to accomodate the renovation of the Rainbow Room and reopened to the public in 2005. The deck, which is built to resemble the deck of an ocean liner, offers sightseers a bird's eye view of the city, and has been co-opted for NBC's Sunday Night Football. The Art Deco decoration of the building follows heroic and mythical themes glorfying modernity. In the niche above the main entrance is Lee Lawrie's sculptural group, consisting of Wisdom, flanked on the left by Light and on the right by Sound. Over the 45th Street entrance is Leo Freidhandler's Television. While under construction in 1932, the GE Building is where the famous photo "Lunchtime atop a skyscraper" was taken by Charles C. Ebbets. The photo shows 11 construction workers eating whilst sitting on a steel beam seemingly suspended in mid-air. Rockefeller Center was designated a landmark by the New York City Landmarks Preservation Commission in 1985. In 2007, Rockefeller Center was ranked #56 on the AIA 150 America's Favorite Architecture list.